Labelmate Label Slitters are practical devices for making custom size labels that help solve the problem of the limited variety of standard label sizes available for digital label printers. Rolls of labels may be slit along their length to make labels of almost any width. Label rolls are fed through a row of blades set at various positions to create label strips of your chosen widths. Using slitters, you can customize label width or height. You can also print multiple labels up and slit them into single labels, increasing production speed and reducing costs significantly. Label slitting is a practical method of making custom size labels and helps solve the problem of the limited variety of standard label sizes available for digital label printers. Customize label height (if labels are printed sideways). Print multiple labels "up" (across) on single labels and slit the single labels into their final size. This may also increase production speed and reduce label and printer maintenance costs significantly. Create vary narrow or short lables that are not available as standard sizes or are too narrow to be printed except as multiple up. Labelmate rewinders are easy to set up and silent in operation. Rugged, heavy-gauge welded steel construction and precision parts yield a product of the highest quality. Slitters can be used either inline or offline. For inline use, a slitter is placed between the printer output and a rewinder. The slitting speed is determined by the printer output speed. Inline is OK for use with most thermal printers but not with color printers. (Color printers are very sensitive and their output cannot be slit as it is being printed.) Inline use is also not recommended when using more than two blades. 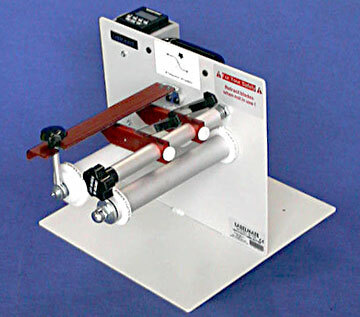 In offline use, a slitter is placed between an unwinder and a rewinder. 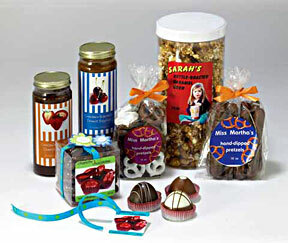 Offline slitting is recommended for already printed labels (such as color labels) and work with three or more blades. With slitting speeds up to 76cm/sec (30 ips) in off-line mode, you can make fast work of your slitting jobs. For offline use, an optional six-digit PC-1 Pre-set Counter allows you to set the number of labels to be slit. When the counter reaches the preset number, it sends a �halt� signal to the rewinder. Power to the rewinder motor is then shut off and braking applied so you�ll have no annoying label spills. Slitting blades are easily replaced and are click-adjustable to maximize their life. Special, very sharp, ground steel blades are supplied with the S-100 unwinder and the same are recommended for replacement. No tools are required for blade adjustment or replacement. During slitting, the blades are stabilized with Labelmate�s proprietary system, giving a clean cut at all speeds. Label Width: Up to 6.5-inches (170mm). Number of Blades: 2 included. Speed: Same as printer speed for in-line use. Up to 76cm/sec (30-ips) in off-line use. Power: No power is required for the slitter itself. Greater Label Width: Up to 10-inches (255 mm ) label width. More Blades: 3 included and recommended maximum of 5. Blade Holders: Additional Blade Holders Model BH-1 are field-installable. Includes blade. Replacement Blades: Use Special Precision High Speed Cutter Replacement Blades for longest life and best performance. Ten blades are supplied in a convenient dispenser. Label Counter: For offline use, an optional six-digit PC-1 Pre-set Counter allows you to set the number of labels to be slit. When the counter reaches the preset number, halts the rewinder. Warranty: Three-year parts and labor limited warranty. One-year warranty on optional preset counter and power supply.